Great Britain's 'Sportie Doc' Tamsin Lewis has been having her best season in the sport to date in 2013. That's not to say she hasn't shown the talent previously - she finished second in her first Pro race back in 2010 at 70.3 Wimbleball, she's been on the podium at Alpe d'Huez Long Course (2011) and won TriStar France in 2012 among several excellent results since turning Pro after winning the ITU Age Group World Champs in 2009. The frustration for those following her progress - and more so for Tamsin I'm sure - has been that the journey through those events has involved (too) many bike crashes, broken collar bones, bike mechanicals and various injury/health issues which have resulted in 'consistency' of performance being a problem. While her contemporaries such as Emma-Kate Lidbury, Eimear Mullan and Lucy Gossage made consistent gains and the results to go with it, the progress of Miss Lewis has been somewhat more unpredictable. Well, 2013 seems to have brought with it Sportie Doc version 2.0, and her potential is being realised. Tamsin Lewis has upped her game, and the results are coming - consistently. Fourth at a (very) strong Ironman 70.3 Mallorca in May, less than a minute back on Lucy Gossage I described at the time as "For Lewis, that in my opinion is perhaps her best performance to date." She then put the frustration of a cancelled (due to landslide...) Ironman 70.3 Switzerland behind her and a week later (though still managing to fit in a bike crash in the interim!) almost took her first Ironman 70.3 win in Italy, passed in the last 200m by Erica Csomor. 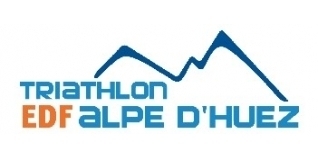 And yesterday, racing over the Short course at Alpe d'Huez, Tamsin took second place to recent ITU World Series Kitzbühel second placer Emma Jackson (AUS) and ahead of 2012 World Duathlon Champion Felicity Sheedy-Ryan (AUS). Again, that is in my eyes a fine result at what is now a short event for Lewis. I got in touch with Tamsin to get her thoughts on Alpe d'Huez and "a little tipsy post wine with dinner" (! ), this is her report of "an extraordinary race that tests every one in different ways." You know I like the long course here .. as I seem to be able to just keep going and make up lost time on the swim. The run is always a sufferfest - but if paced well is ok. I was not expecting huge things today.. I've trained up until the race (going up the Alpe in 54 minutes the day before the race) and was just looking for a good hit out. The swim is always horrendous at Alpe d'Huez and every time I'm in that water I wonder why I come back… the power of the mind to forget. The commisaire said five minutes to go - so I was sitting on the rocks after 'warming up' and was going to swim across to the other side where some of the other pro's were. As I was about to - the line of swimmers just went - BAM! Before any warning and I didn't even have my goggles on. So I was totally out of place and in amongst a lot of hands and feet. We get spoilt with Pro starts - but the Alpe start reminds one just how horrid mass starts are. Guys were hitting out left, right and centre and all concern for technique went out of the window as I just moved my arms as fast as I could. I always find the cold of the lake (despite 30 degress outside temp.. it was still 15degrees in the lake I'm told), make my swim coordination totally pansy. My swim has improved a lot and with the cold and the disorganised start I only started to get a rhythm in the last couple of hundred metres. I was thinking how far behind I was (a recurrent theme in the Alpe d'Huez swim when faced with Sutto's uber swimmers), and that it would take some effort to get back up - but I just thought "plough on - you never know what can happen". T1 was slow - as in I lost 48seconds to most of the other girls because the French official made me go back from the mount line and put my wetsuit and goggles properly in the black bag. They were in - just not to the French standards of 'in'! The bike usually takes me 20 minutes or so to come good but there was no time to be lost - and bearing in mind that only Caroline Steffen and I were riding TT bikes - Brett had said that we needed to get aero and put in time in the first flattish 14k. Well we did that - but it was obvious that there were packs up the road and that for once the drafting officials were in upcoming French holiday mode. I hit the Alpe not knowing where I was placings wise but just rode within myself until I started seeing other girls. It was very hot and I would see my watts (Rotor Cranks) dropping as I started to overheat - missing some water at the aid station. Then I was handed a cold bottle of Evian at the next aid station and I felt totally rejuvenated and the watts crept up again. I took confidence from catching and passing girls - but it was passing Caroline Steffen that boosted me. I understand that this is a training race for her (as me) and she was pushing the trademark huge gear/low cadence - 42 tooth chain ring she told me over post-race Gatorade in the ice baths! (Brett had told her this was an error on the supply front!). The final km's on the Alpe and I had passed Sheedy-Ryan and Celine Schaerer (who has improved markedly the last 18months - although she got a head start today on the swim!) 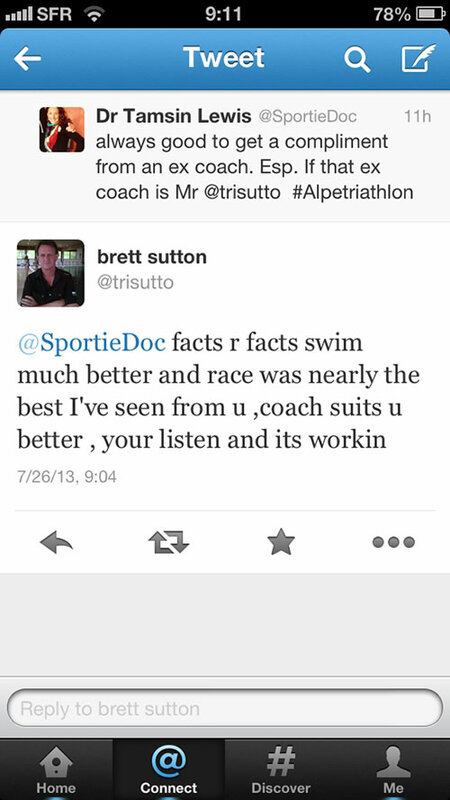 - Brett was on the sidelines saying - "come on, you need to push now Celine for the podium" - and I accelerated past. Sheedy-Ryan dropped and Celine held on pretty much 10 seconds behind. I was still aware that we had to run so I kept it sensible as the run at 2000m altitude always hurts a bit (especially if you not altitude adapted - which I wasn't this time). The run - well - once again the French official had me a time penalty (20seconds) because I undid my helmet just before I racked. Running out I thought I would hold off Celine, but didn't feel so confident about Sheedy-Ryan. I didn't look back once.. just ploughed on to the finish line at a pace I felt I could sustain. The run is very technical - hilly - trail/rocks etc - although I was told I wasted some time high fiving (I like to give back to the supporters!) in the finish shoot! Overall, a fantastic few days. It really should be on every triathlete's to-do list - an extraordinary race that tests every one in different ways. Its also super that the race organizers look after their pro's which makes lower prize money easier to deal with. Cyrille Neveu puts the pro's up in a hotel with breakfast and always pays the prize money within a few weeks - I cannot say the same about other more notable triathlon organisations.